Recreational vehicles, also known as ATV’s, are exciting and fun modes of transportation. They provide a great means of escape on weekends and vacations, but ownership of these thrill-seeking vehicles creates the need for special insurance to protect you, your passengers and others. While all recreational-type vehicles can be protected by the same basic coverage’s, each one has its own special requirements and restrictions based on what type of usage the ATV will provide. Making the right choice of coverage’s for your recreational vehicle now, can save you plenty of money and aggravation later. If you ride your ATV either on or off the boundaries of your property, your homeowner’s policy does not automatically cover you. And most auto policies don’t include important coverage’s you need. What’s more, even minor recreational vehicle claims can dramatically increase your entire auto insurance bill which is not the most prudent means to protect yourself or others. But we have a solution! At Atlass Insurance, we can provide you with affordable liability and property coverage for your recreational vehicle so all you have to worry about is having a great time. Specific recreational vehicle coverage will replace losses such as theft, vandalism and collision to your recreational vehicle. Your home and car insurance can’t do that for you. Recreational vehicle insurance policies can provide total loss coverage to ensure that you can replace your recreational vehicle in the event of a covered loss. If your child and his/her friends take your ATVs out for the weekend and have a serious or fatal accident, do you realize that you can be held personally liable for the losses? What if the injured party requires extensive medical care and is unable to work? Are you covered? Can you afford to pay the hospital bills and cover their paycheck for an indefinite period of time – Out of your own pocket? Depending on the amount in question, you could lose all of the assets you’ve worked so hard to accumulate and Atlass Insurance is keen on making certain that won’t happen to you! The above scenario plays itself out every year thousands of times. 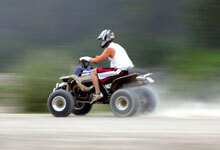 Recreation vehicle and ATV accidents are common for people all ages. Whether you are an outdoor trail blazer or using your ATV unit at the hunting camp, things can and will happen but those best prepared with proper coverage have the peace of mind knowing that they are well covered and all that is left to do is Have Fun! Atlass Insurance Group can provide you with affordable liability and property coverage for your recreational vehicle/ATV so all you have to worry about is having a great time! Contact our office today for the right combination of coverage at the best value, before you or your family members use any type of recreational vehicle. We can assist you to better understand your present coverage limits, extend your homeowners coverage or advise you on separate recreational vehicle coverage to maximize your enjoyment and meet the insurance needs for your recreation equipment.